March 17, 2015, 5:07 p.m.
Old post, but here are a few of the cruisers in the collection. Is the chrome one in front an Kona Humma Humma Numma Numma Aku puar? Was that even the name? I don't really remember, I just remember the name being ridiculously long and having the distinctive extra cross bar. EDIT - I just noticed a second one in the background. Ha! The guy who inspired me to ride in the first place used to courier and do stair gaps on one of those with profile cranks, mammoth rims, and a 1998 z-1. I have since gotten rid of the deep v's in favor of some normal black lightweight road rims. It was a good decision. 47-13 tooths . It's not slow. March 19, 2015, 9:36 a.m.
Schwinn three wheel, lawn art. March 20, 2015, 9:28 a.m.
June 9, 2015, 10:25 a.m.
June 13, 2015, 3:10 p.m.
Oct. 30, 2015, 7:32 a.m.
Nov. 10, 2015, 12:26 p.m.
Nov. 11, 2015, 9:30 a.m. Here's my Mixie. A 1981 Apollo sport 10 hi ten steel frame I found in the dumpster at work. Converted to a 9 speed tiagra drive train with sti shifters. Shimano 600 brakes. 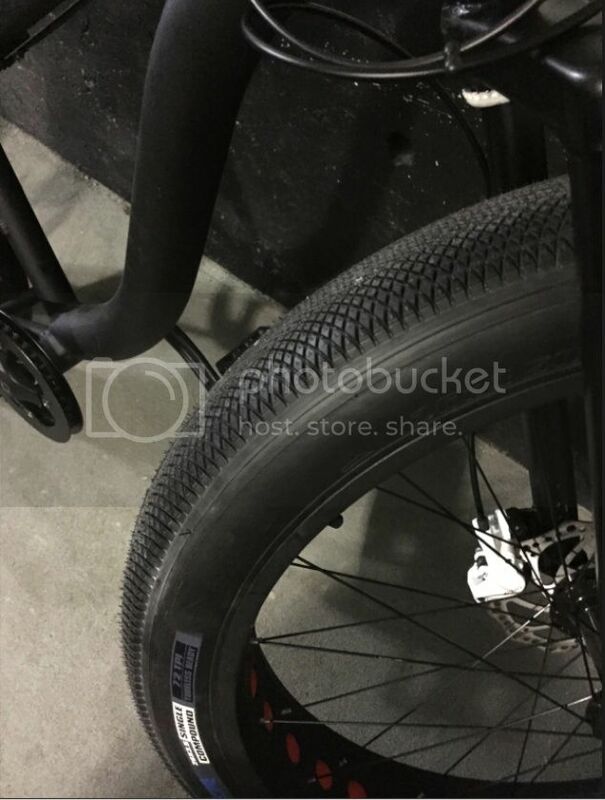 A 700 bontrager rear wheel with a 38mm tire. Brake reach was an issue so I had to keep the old 27" front until I find a good deal on long reach brakes. The rear is mounted with a surprisingly strong and stabile bracket from home depot. March 29, 2016, 4:19 p.m. Turning an old hardtail into a commuter. I singlespeeded it but I think I'm going to go back to gears for commuting. Anyway I want to replace the 100 mm suspension fork with a disk friendly rigid fork that can accept a full fender. I think the Surly Troll would do the trick as it's 100 mm with sag compensated (455ish axle to crown) has disk brake posts and is drilled for fenders too. How about bars? I've got some wide riser bars (760 mm I think) but I wonder if I should go with something with multiple hand positions…not drop bars (I want something that works with my mtb BB7's) but maybe…shudder…bar ends?? March 31, 2016, 6:32 p.m. If you're ordering from surly, maybe these? I've been eyeing them for a while. April 1, 2016, 12:33 p.m.
May 9, 2016, 5:42 p.m.
Bay Street Corridor commuter/roundabout towner/maybe the Don Ravine (at night)/maybe more if I can slave up my B.O.B trailer . . .